Galaxies in the early universe are shrouded in a kind of mist: a cloud of hydrogen. 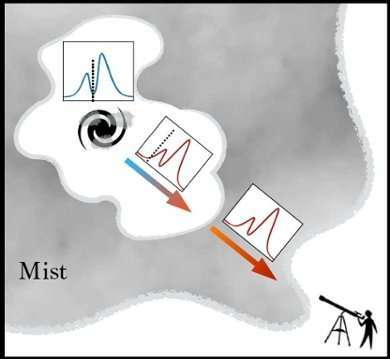 With galaxies in the later universe this mist has disappeared. 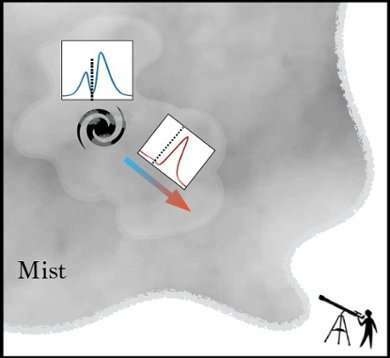 Astronomer Jorryt Matthee has made the first images of this dissipating mist. Ph.D. defence 19 September. It is an interesting phenomenon: if we look at stars that are a long way off, we are in fact looking back in time. The light from these stars has taken so long to reach us that what we are seeing is actually in the past. 'That's why studying distant galaxies can teach us about the origin of our own galaxy,' Jorryt Matthee explains. For his Ph.D. research he is therefore looking more deeply into these distant galaxies. An image of a galaxy shrouded in mist is very different from what you might think. Matthee: 'When we look at a galaxy with a telescope—in this case the Very Large Telescope in Chile – we are looking at the spectrum of light that it emits. The image is actually a graph with different lines for the different colours of the light.' A specific characteristic of the galaxy can be deduced from each colour. Matthee was able to determine the presence of the mist, the cloud of hydrogen, from the graph of the so-called Lyman-alpha radiation. The COLA1 galaxy showed not one, but two peaks in the graph, while for a galaxy where the mist is still largely present only one peak is visible (see the illustrations).